Dowager Queen Catherine de’Medici was doing everything within her power to find a bride for her son Henri. 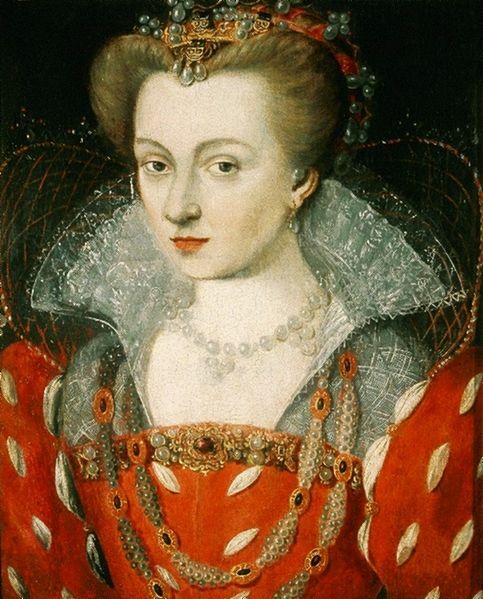 Under consideration were Dona Juana, sister of King Philip II of Spain, Philip’s daughter and Henri’s niece Isabella Clara Eugenia, Henri’s widowed sisters-in-law Mary Queen of Scots and Elizabeth of Austria, Queen Elizabeth I of England or even a Swedish or Danish princess. None of these possibilities panned out. Then Henri did the unthinkable. He chose his own bride, the daughter of a minor house of French nobility. Because Henri was the third son of King Henri II, there was little chance he would sit on the throne of France. In 1573, the Polish kingdom was looking for a ruler and elected Henri as their king. In the autumn, Henri traveled to Krakow. On the way, he stopped at the court of Duke Charles III of Lorraine who was married to his sister Claude. Claude had just given birth to a son and they were celebrating his christening. Because Claude was indisposed, the events were hosted by Catherine, the Countess of Vaudémont. The Countess of Vaudémont’s step-daughter Louise was a part of her train and came to the attention of Henri. She was nineteen years old, blond and beautiful. Henri requested Louise be introduced to him and give him a dance. The Duke of Lorraine presented his niece and Henri learned she was the daughter of the Count de Vaudémont by his first wife. Henri rarely left the side of Louise during his stay in Nancy. He was charmed by her humbleness and gentle manners. Louise noticeably resembled Marie of Clèves, the wife of Henri’s enemy the Prince de Condé. Henri was obsessed with Marie and wanted to marry her even though she was already married and the relationship was idealized and platonic. Louise was born on April 30, 1553 at the castle of Nomeny. She was the daughter of Nicholas, Duke of Mercoeur and Count of Vaudémont, a younger branch of the House of Lorraine and cousins of the House of Guise. 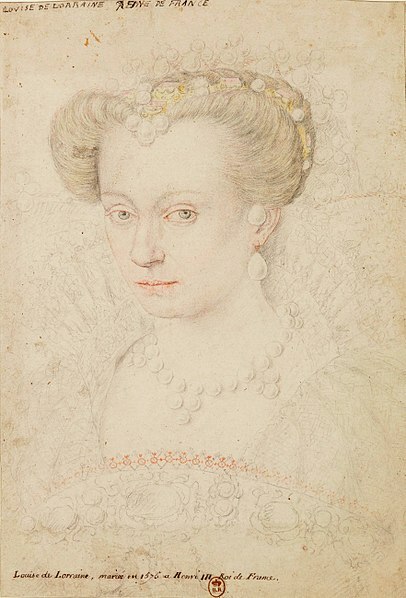 Her mother was Marguerite d’Egmont, sister of the Count of Egmont, ruler of the Netherlands who had been executed in 1568 upon the command of King Philip II of Spain. Louise’s mother died within a year of her birth and her father married Jeanne de Savoye, sister of the Duke de Nemours. Jeanne was a caring, loving stepmother and ensured Louise was given a solid classical education. She introduced Louise to the court at Nancy at the age of ten. Jeanne de Savoye died when Louise was fifteen and her father married for a third time. Catherine was the second daughter of the Duke d’Aumale, son of Claude, first Duke de Guise by Louise de Brezé, daughter of Diane de Poitiers and her husband the Count de Maulevrier, Grand-Sénéchal of Normandy. These various wives produced many half-brothers and sisters for Louise. Catherine was only three years older than Louise and showed favoritism to her own children at the expense of Louise and her siblings by Jeanne de Savoye. Louise’s father did nothing to mitigate the mistreatment and neglect at the hands of her stepmother. She was not allowed to participate in the diversions of her father’s court. Catherine gave certain luxuries and privileges that were due to Louise to her own daughters. Louise was given a room in a distant part of the palace where she lived in isolation. Her main companion was Mademoiselle de Changy and she received visits from one of her step-brothers, the son of Jeanne de Savoy. These circumstances made Louise sedate and serious, gentle in temperament, sensitive and pious. After meeting Henri in 1573, Louise continued to pursue her secluded life, going on benevolent missions, praying, reading, making pilgrimages to the shrine of St. Nicholas, embroidering and studying. She had many inquiries for her hand, including the Count de Thoré, brother of the Marechal de Montmorency. She formed an attachment to Prince Paul of Salms but this alliance was opposed by her family because they wanted her to marry François de Luxembourg, Count de Brienne. Henri’s brother, King Charles IX died in May of 1574. Henri immediately returned to France to claim the throne. On October 30, 1574, the object of Henri’s obsession Marie of Clèves died of a lung infection. Henri was broken-hearted but his mother assured him she would find him a wife and began negotiations to marry him to the Swedish princess Elisabeth Wasa. Henri had other ideas. He had decided in secret to marry Louise de Vaudémont, the princess from Lorraine who resembled Marie of Clèves. But for now he kept quiet about his decision. In January of 1575, Henri informed his mother of his plan. Catherine was disappointed in Henri’s choice as Louise was not a princess and would not bring a large dowry to the arrangement. But she realized she could not change Henri’s mind. Once Henri made known his decision, word was sent via private missive to the Duke de Lorraine. Hours later, Philippe Hurault de Cheverny and Michel Du Guast, Marquis de Montgauger arrived in Nancy to the astonishment of the Duke, his wife and Louise’s parents. Du Guast’s intention was to exchange rings of betrothal with Louise on behalf of the king and to deliver letters from Henri and Catherine de’Medici to Louise and her parents and he spoke with the Duke of Lorraine and Louise’s father most of the night. The next day Louise had overslept and was taken by complete surprise when her stepmother entered her room to awaken her and curtsied to her three times. Louise thought it was a joke and that she was in trouble for staying in bed too long. When her father entered the room and bowed to her twice, she realized all was serious. Louise met with Du Guast and accepted the king’s proposal. Three days later, Louise, her parents and the Duke of Lorraine left for Reims where Henri was to be crowned. Cheverny was sent to meet her in Sommières and gave her a letter from Henri, a portrait of the king and a casket of jewels. Louise seemed to barely acknowledge her enhanced position. Henri would observe this and was shocked by her indifference. Henri borrowed 100,000 écus for upcoming expenses and traveled north from Avignon with his mother and the court, heading for Reims for his coronation and marriage. Henri was crowned at Reims on February 13, 1575. The day after the coronation, Louise and Henri were betrothed by the Cardinal de Guise. The marriage contract was finalized and Louise was given an ample dowry. A stately banquet was held and the marriage was to take place the next day. The king set out to reinvent Louise in his own idealized image. Henri designed Louise’s wedding gown as well as other costumes for the wedding. He arranged the jewels on her robe. Louise seemed to enjoy the attention he gave her. She was very patient and sweet-natured as Henri fussed over her. While he was sewing one of the precious gems to her wedding dress, he managed to prick her skin with the needle. Louise didn’t even make a cry over the injury. He insisted on dressing Louise’s hair himself and placing the diadem on her head. After taking laborious time to make her hair just right, it was too late for the ceremony to happen as planned in the morning and the wedding took place in the evening with the ceremony officiated by the Cardinal de Bourbon. They were married under a canopy of cloth of gold at the portal of Notre Dame de Rheims. This was followed by a banquet, a ballet and a ball. The king and queen danced a minuet and then a Gaillarde to the great admiration of the spectators. They returned to the capital and for several weeks the queen and king visited the churches of Paris and offered alms. Louise and Henri made these visits often and the nuns enjoyed Louise’s company. Immediately there was conflict in the marriage. Henri insisted that all the waiting women who had come with Louise be dismissed and he required he alone name all the replacements. Louise’s parents also left. The queen did not have the necessary persuasive powers to control her husband’s behavior or exercise political power. The court seemed frivolous and dissipated. She was in awe of Henri and dreaded the behavior of his mignons (favorites). She did not have the energy or the experience to command a circle at court and was uneasy in the presence of her mistress of the robes, the Duchess de Nevers. She was overshadowed by her mother-in-law Catherine de’Medici who refused to retire or yield to Louise her position as first lady of France. Catherine de’Medici did everything she could to keep Henri and Louise apart to minimize the new queen’s influence. Consequently Louise’s position at court was marginal. Louise may have suffered a miscarriage in the spring of 1576, possibly ruining her chances of ever becoming pregnant again. Even so, Henri and Louise continued to hope for a child. In November of 1576, Louise and Henri established oratories in all the churches of Paris and made pilgrimage to them all, giving alms in the hopes of her getting pregnant. It appeared she was unable to produce a Valois heir and she became thin and suffered bouts of melancholy. But court chroniclers say Louise tolerated her awkward, humiliating and anonymous position with forbearance and grace. Henri purchased the castle of Olinville in the neighborhood of Chartres for Louise. 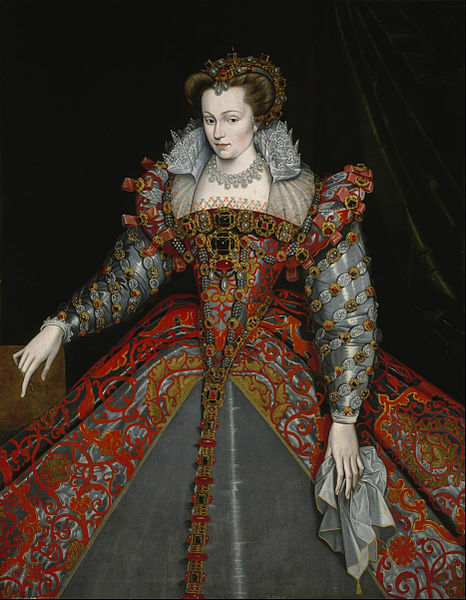 She traveled with the king to Rouen and attended the opening of the Estates General at Blois in December of 1576. They entertained members of the Estates with balls, tilting at the ring, jousts, banquets, gambling and masquerades. These festivities were curtailed upon the death of Louise’s father on January 28, 1577. 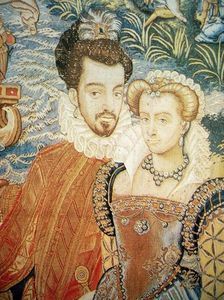 After signing a peace treaty ending religious strife in February 1577, Henri and Louise went on an expedition to Blois. It was well known at court that Louise and Henri rarely spent time together. She did appear with the king on important occasions. But Henri appeared to tire of Louise’s company and preferred the camaraderie of his mignons and ladies-in-waiting. Yet he never named another woman maîtresse-en-titre. Louise sought the company of her women, prayed, visited hospitals, cared for the sick, performed acts of charity and patronized charitable foundations. The people of Paris came to appreciate her for her sweet nature, beauty and piety. A spectacular fete was staged in the Salle Bourbon in Paris on September 24, 1581. The occasion was the marriage of the Duke de Joyeuse to Louise’s half-sister Marguerite. The most famous of the seventeen entertainments was the Ballet comique de la reine which was presented by Queen Louise. She had employed her own team of poets and musicians in creating the ballet. At the end of the show, Catherine de’Medici compelled Louise to give Henri a gold medal depicting a dolphin swimming in the sea. It was an expression of her hope that the king and queen would have a male heir to inherit the throne. In the spring of 1588, there was tension in the capital. Henri had no male heir and the next in line was Henri of Navarre who was openly Protestant. The Catholic League, led by the Guise family, didn’t want to see a Protestant on the throne. The Duke de Guise had defied a royal ban from the city of Paris. In response, Henri brought in French and Swiss troops. The Parisians were incensed with foreign troops in the city and they set up barricades and fought back, killing some of the king’s troops. Louise sided with Henri in the conflicts in open defiance of her own family. Hostilities increased and the king fled to Chartres. Queen Louise and Catherine de’ Medici were not allowed to leave the Hôtel de la Reine. Security was tightened around the two queens and a new government headed by the Leaguers was installed. Catherine tried to mediate between the League and the king and although Henri was stubborn, he eventually capitulated. A Te Deum was celebrated at Notre-Dame Cathedral attended by the two queens. They were released from their captivity and traveled to Mantes to meet up with Henri on July 23. Catherine wanted Henri to return to Paris but he left for Chartres taking Louise with him. Catherine de’Medici died in January of 1589 and Louise attended the funeral. She may have expected to take her rightful place at court but it was not to be. In the summer of 1589, the Wars of Religion raged. The authority of King Henri III was severely destabilized by a litany of political parties which were being funded by foreign powers. The Catholic League was supported by King Philip II of Spain, the protestant French Huguenots were supported by the Dutch and Queen Elizabeth I of England and the Malcontents who were led by Henri’s younger brother the Duke of Alençon. The Malcontents were made up of Catholic and protestant aristocrats who jointly opposed the absolutist ambitions of the king. Henri himself took the position that a strong and religiously tolerant monarchy would save France from collapse. Henri went on campaign and said his goodbyes to Louise at the château of Chinon where Louise was to remain in safety. Louise was depressed at her separation from her husband. On August 1, Henri was staying with is army at Saint-Cloud, preparing to attack Paris. He allowed a fanatical Dominican friar, Jacques Clément into his presence. Clément had brought false papers and while Henri read the papers, he stabbed Henri in the abdomen. The wound did not appear to be fatal at first and Henri was able to dictate a letter to Louise explaining what had happened. However, the wound had perforated his bowels and he died on August 2. Louise received word of Henri’s death and left Chinon for the château of Chenonceau. She mourned Henri’s death and vowed to avenge it. She broke off all relations with her family of Lorraine and was a proponent of the new King Henri IV. She spent her widowhood in Chenonceau in austerity. Her apartments consisted of two chambers next to the chapel which was hung with black cloth. The ceilings and wainscots were painted black and embossed with cornucopias and silver tears. She wrote many appeals to King Henri IV asking for justice regarding the murderers of her husband. In 1593, she traveled to Mantes to seek an audience with the king. Henri IV received her in public in the church of Notre Dame. Louise fell to his feet and implored him to avenge her husband’s murder and asked that his remains be taken to the royal mausoleum. Henri raised her up and promised to comply with her requests as soon as he was able. Louise returned to Chenonceau and spent the next seven years in seclusion, giving lodgings to many Capuchin nuns. In her will she left twenty-thousand crowns in a trust to her sister-in-law the Duchess de Mercoeur to build and endow a convent for the Capuchins of Bourges. However, the duchess, upon the advice of the king, purchased a site in the Rue St. Honoré in Paris instead. On June 18, 1606, the Capucines took possession of their new house and it was the first nunnery of their order in France. In 1600, Louise moved from Chenonceau to the castle of Moulins. Her health deteriorated and she died of dropsy on January 29, 1601 at the age of forty seven. She was interred before the high altar in the chapel of the Capuchin nuns. In 1688, the remains were moved to the chapel of the Capuchins in the Rue Neuve des Petits Champs. Her remains made several more moves before being deposited in a vault at St. Denis in 1817.